Be the first to share your favorite memory, photo or story of Reneé. This memorial page is dedicated for family, friends and future generations to celebrate the life of their loved one. 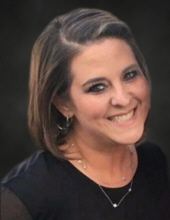 Renee Anna Kan, age 41 of Midland, passed away February 8, 2019 in Midland, Texas. Funeral services will be held at 2 p.m., Wednesday, February 13th at Gunsight Baptist Church with Rev. Rex Boggs officiating. Interment will follow in the Breckenridge Cemetery under the direction of Morehart Mortuary. Visitation will be held from 6 p.m. to 7 p.m. on Tuesday, February 12th at Morehart Mortuary. Renee Anna Townson was born on December 30, 1977 in Lubbock, Texas. When she was two, her family moved to Breckenridge where she attended school and graduated with honors from Breckenridge High School in 1996. In school, she was involved in volleyball, softball, was a member of the National Honor Society and even worked in the Marine Biology Program at Sea World. She was also a member of Gunsight Baptist Church. After high school, Renee attended Southwest Texas State University in San Marcos. She worked her way through college at the Gruene General Store in Gruene. Renee graduated from college in 2000. On December 14, 2001, she married Jason Kan in Las Vegas, Nevada. She worked at the Tarrant County Battered Women’s Shelter and later taught Special Education in Arlington. After moving to Midland in 2011, she was the homeless student liaison for Ector County ISD, where she impacted the lives of many hopeless children who loved and adored her. She was preceded in death by her grandfather, Weaver Adair and grandmother, Dortha Townson. Renee is survived by her beloved husband, Jason Kan of Midland; the light of her life, her son, Cameron Kan of Midland; two step-daughters, De’Cymber McNabb and husband Tyler of Midland, Kalynn Hewlett and husband Josh of Abilene; mother, Paige Adair of Albany; father, Rickey Townson of Breckenridge; brothers, Matthew Langford and wife Angela, Chad Townson and wife Lara, all of Breckenridge; sister, Kristen Tucker and husband Paul of Allen; one grandson, Blanton McNabb of Midland; grandparents, Elaine Adair, Johnny Townson; mother-in-law, Joey Lozowski; and several aunts, uncles, nieces and nephews. In lieu of flowers, the family requests donations be made to the Mighty Rebel Band of Midland Lee High School or to the charity of the donor’s choice and may be left at Morehart Mortuary. Condolences may be made online at www.morehartmortuary.net. 10674 US Hwy. 183 S.
"Email Address" would like to share the life celebration of Reneé Kan. Click on the "link" to go to share a favorite memory or leave a condolence message for the family.